Lest we forget: one hundred years BEFORE the 1965 Voting Rights March focused on the Dallas county courthouse in nearby Selma, a brave community of recently emancipated African-Americans gathered around an older courthouse in Cahawba. These 19th century "foot soldiers" exercised their right to vote and - for a brief time - gained great political power. 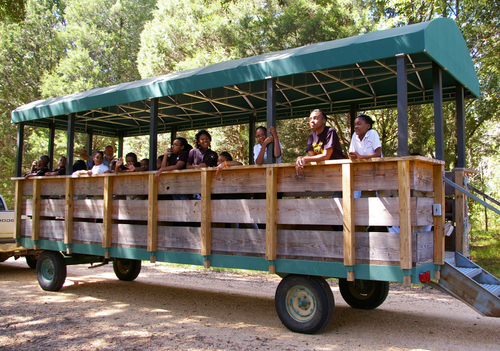 This wagon tour tells the story of Cahawba's African American majority and traces their path from slavery to freedom with a special emphasis on how they reshaped Cahawba as they pursued their dreams of equality. From downtown Selma, take Highway 22 (Dallas Avenue) west 8.6 miles. Cross over the Cahaba River and turn left onto County Road 9 and follow this 3.3 miles until it dead ends. Turn left onto County Road 2 and follow this 1.5 miles until you see the Welcome Center on the right. Orrville is located in the Montgomery & Selma Region of South Alabama. Be sure to check out places to Go, Eat, Stay, and other events in Orrville.